There is something living in the north-facing wall of our apartment. My partner and I have narrowed it down to an organism in the phylum Chordata; though we have not seen the thing, we are fairly certain it has a backbone. It likes to make squeaking or cawing noises at 4 a.m. Sometimes the noises make it seem very small, like a house mouse, and sometimes the noises make it seem very large, like a well-nourished raccoon. Or perhaps it is a bird. Perhaps it is a new, awesome bird species. We know so little about the organisms that live with us, in our walls, behind the refrigerator, under the toilet seat, above the rafters, on our skin. What are they? How many of them are there? Are they adapted to indoor environments? To each other? At the turn of the 20th century, ecologists distinguished themselves from colleagues investigating physiology in the laboratory by studying outdoor spaces. Their work led to many now-popular concepts, including biomes – major ecological community types like “tundra,” “deserts,” and “temperate grasslands.” Recently, work in urban ecology has turned our attention to built environments – outdoor built environments, that is. But what about indoor environments? In our review we found that the area of the indoor biome is expansive – and expanding. 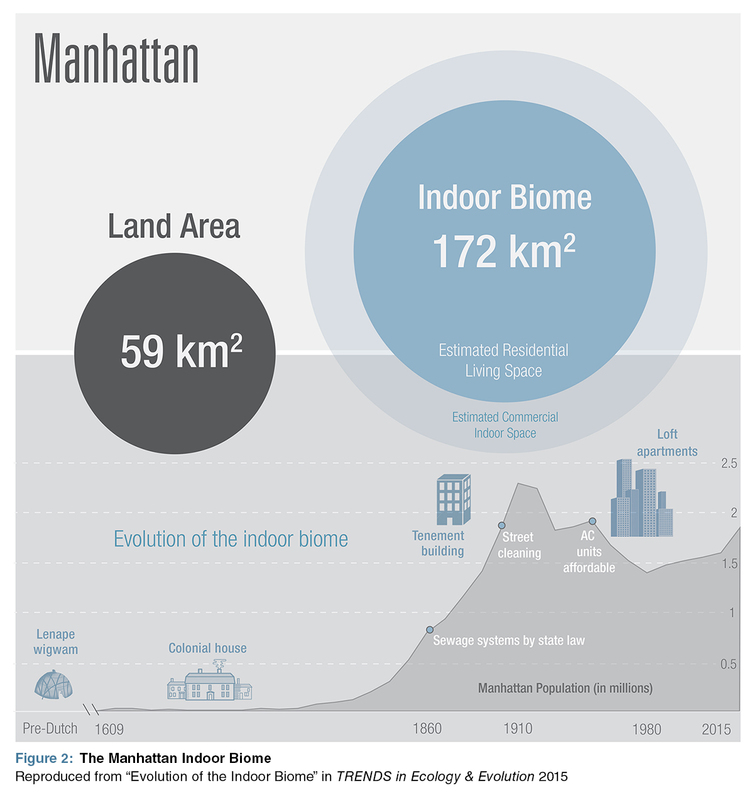 The indoor biome in Manhattan, for example, is now nearly three times as large, in terms of its floor space, as is the geographical area of the island itself. Thus we argue that the indoor biome should be considered an ecologically and evolutionarily significant environment. We organized our review around three big questions: (i) How did species come to populate the indoor biome? (ii) Which traits does the indoor biome select for? (iii) How will changes in human culture affect indoor evolution? To explore these questions, we reviewed literature from many sub-disciplines. Perhaps unsurprisingly, we found the most information published on “pest species” like German cockroaches and bedbugs. A number of researchers have also studied the evolutionary history of domestication. This leaves open a suite of fundamental and applied questions regarding the thousands – or tens of thousands – of other species found indoors. For example: Which traits does the indoor biome select for? Previous researchers (Lundholm and Marlin, 2006) noted that urban and indoor environments were similar to cave environments, and suggested, on the basis of these similarities, that we might see disproportionately more cave species in urban habitats because they had pre-adaptations to city life. We took this hypothesis a step further, suggesting that indoor environments select for some of the same traits that caves do. Many indoor arthropods, for example, have flattened body plans, presumably because this body type better fits in crevices. And some arthropods in houses (e.g. cockroaches, silverfish, crickets), like those that live in caves, have poor vision but longer antennae, which are often used as “whiskers” for feeling out edges. We hope that our review will motivate new studies of the indoor biome. Such studies are well suited for citizen science projects, public outreach, and large-scale international collaborations. Already there are a few examples of such projects. For example, The Home Microbiome Study, coordinated by Argonne National Laboratories, asks volunteers who are about to move to another house to collect microbial samples from doorknobs, light switches, floors, and countertops. Your Wild Life – where you’ve landed on the Internet! 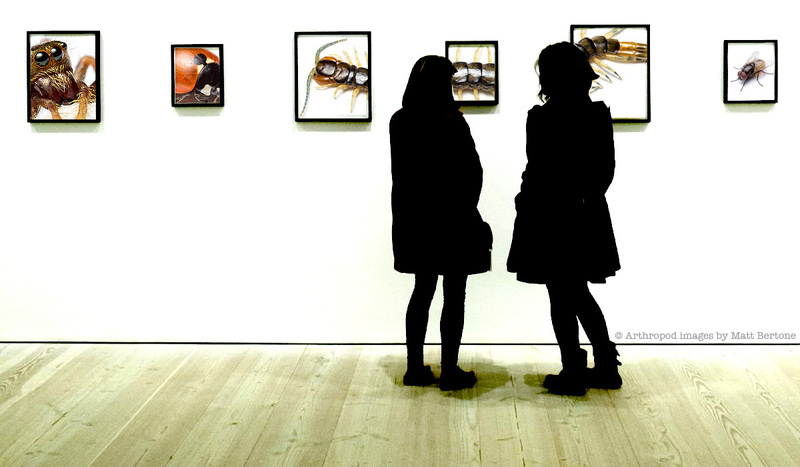 – has sponsored several citizen science projects exploring the arthropods and microbes of the indoor biome. Most exciting is that the study of indoor biomes has the potential to bring evolution right to our own doorsteps. Laura Jane Martin is a writer and PhD candidate at Cornell University, where she researches the intersection of ecology and society. Follow her at @Laura_J_Martin.